Dia de los Muertos is a vibrant, festive traditional celebration of remembrance in the cultures of Latino people around the world. At the exhibit, you'll learn about this rich cultural event, which is blend of Aztec traditions of remembering the dead and the Catholic tradition of celebration of All Saints Day and All Souls Day tradition brought by the Spanish conquistadors. We invite all of our Valley's cultures to share their traditions in honoring the lives of those who have died. This includes relatives, friends, special heroes, and especially the Angelitos (the little children). Our goal is to provide a shared cultural experience for our community and to bring people to downtown Yakima. The structure of the majority of the altars is created by stacking boxes in three tiers. The three tiers represent birth, life and after life. Altars can be made in many ways from traditional to modern design. They can commemorate loved ones, community leaders and even our pets. If you, your family, or group/organization would like to build an altar in our Yakima Exhibit, download an application and mail it to Yakima-Morelia Sister City Assn. P. O. Box 1048 Yakima 98907. In 2005, a group of community organizations including The Yakima Symphony, The Yakima-Morelia Sister City Association, For A Better Tomorrow, the Yakima Valley Museum and individual community leaders came together to bring the first Annual Dia de los Muertos exhibit to Yakima. Yakima's first exhibit opened with 11 altars built by local community organizations. Several downtown businesses also participated by building altars. The exhibition was very well received, and the Yakima School District was contacted to have its students tour the exhibit. Starting in 2006, the Yakima Symphony brought a pianist from Morelia's 300 year old Conservatoria de las Rosas to perform in Yakima at The Seasons Performance Hall for a Special Noche De Muertos Concert. 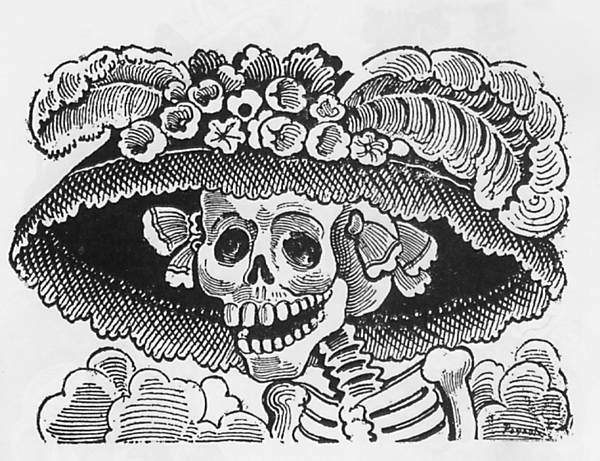 According to Mexican Folklore, "La Catrina" --also known as death-- can show herself in many different ways. Sometimes she is dressed in a rather elaborate, festive way. This conspicuous --and perennial-- guest is paradoxically also associated with the joy of life in the face of the imminence and inevitability of death. We only live once and La Catrina, with her mischievous smile, pleads with us to seize the moment and through music --and perhaps a little dance--, find life's meaning. Marigolds, the "flower of the dead," are an important symbol. Their scent is believed to attract the souls and draw them back. Papel picado ("perforated paper") is the Mexican art of papercutting into elaborate designs. The designs are commonly cut from tissue paper using a guide and small chisels, creating as many as forty banners at a time. Vibrant pink, orange, and purple are the key tones employed for ofrendas (offerings) associated with the Day of the Dead. Recognize that cultures have celebrations unique to them. Learn that a holiday celebrated by one ethnic culture may be honored in many countries as the cultural group disperses among different areas. Understand the significance of the altars in relation to a particular culture.